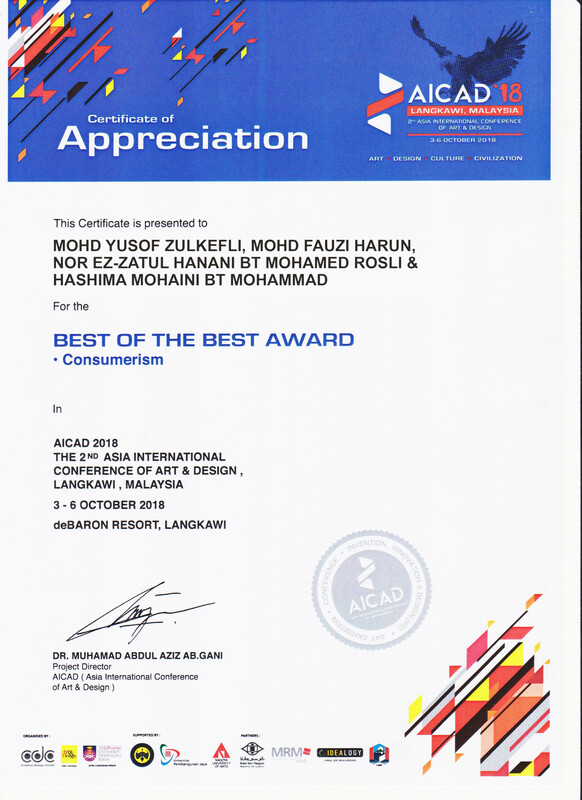 A team of academics from the Faculty of Arts and Social Science, namely Mohd Yusof bin Zulkefli, Mohd Fauzi bin Harun, Nor Ez-zatul Hanani binti Mohamed Rosli and Hashima Mohaini binti Mohammad, were awarded the “Best of the Best Award (Best Paper Award)”, at the 2nd Asia International Conference of Arts and Design (AICAD) 2018, held at De Baron Resort,Langkawi from 3 to 6 October 2018. 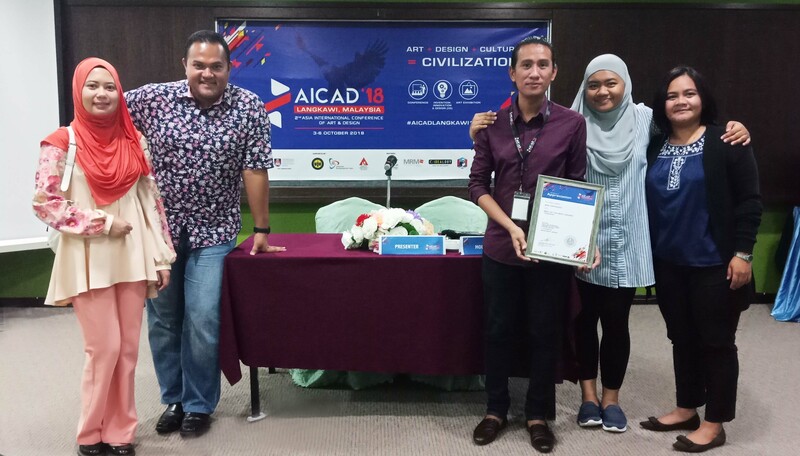 Themed ‘ART + DESIGN + CULTURE = CIVILIZATION’, AICAD 2018 was jointly organised by Creative Design Center (CDC), Universiti Teknologi Mara (UiTM) Perak, Institut Seni Budaya Indonesia (ISBI), and Universiti Pembangunan Jaya, Jakarta Indonesia. The conference aimed to provide a platform to acknowledge various research projects internationally. It also enabled researchers to share their views and research. “Every research requires a great deal of effort, hard work and dedication to get it completed and of course to yield good results. We believe the multidisciplinary perspectives of our research may have been one of the winning factors for us to be chosen among the 58 researches that were reviewed. Added with this award, we believe that it will be a valuable asset to strengthening our credibility as researchers and it is also a recognition of our effort in helping the society. Though the name of the award is stated as “The best of the best” but we feel that we need to continue progressing and improving. 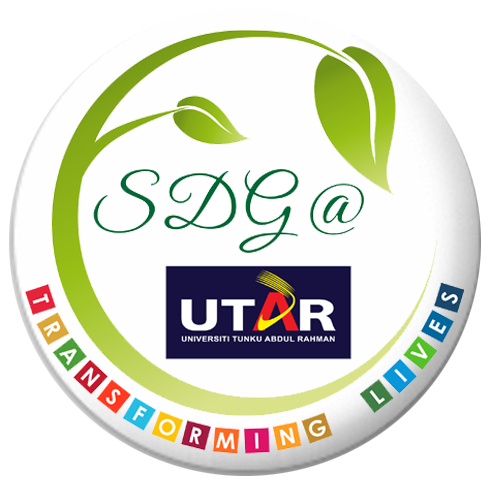 It is also a motivation for us to continue conducting research that will help and educate the society. Regardless of which field of research, all researches should be given equal recognition. Hence, we are certainly more that delighted to be given this award,” said Mohd Yusof. The award-winning paper is titled “Factors that Influence and Stimulate the Consumer Buying Behaviour towards Skin Whitening Product on Social Media Advertisement”. The research aimed to discover the consumers’ opinion towards persuasiveness and believability in social media advertisement. It explained that consumers are exposed to thousands of advertisements (ads) and hampered companies to create a unique position in creating consumer attention. Social media such as Instagram and Facebook helps companies to create unique ads and engender a positive effect on the attitude and sales intention towards the brand. Advertisers use this medium to engage with online potential buyers as a repertoire to be connected as a part of their integrated marketing communications strategy. Not just posting their ads as publicity but in conjunction with parallelising the brand awareness and sales strategy, direct marketing, and public relations. Advertisers utilised the usage of social media to showcase positive testimonials about the effectiveness of their product by enhancing the comments and feedback of the customers. However, not all the advertised product is reliable because they are unregistered with the authority. This could cause misleading information and the users will easily be trapped by the copy or/and visual image featured in the ads. In addition, most of the consumers or potential buyers just rely solely on the information that is fed by the advertisers. Through mixed method in enhancing survey and content analysis, the research looks at the key factor implied by the marketers using visual in attracting the audience, and evaluates the way the marketers motivate the potential buyers in their online purchasing process. When asked of their motivation for conducting the research, the researchers explained that they hope for the research to be educational for consumers, especially when purchasing products from social media platforms. “There is a group of people who wants to have fairer skin and that desire has led them to make purchases of any products in order to get fairer skin, without considering the authenticity of the product, or if the products are certified by governing bodies. Sellers are smart to make use of Facebook and Instagram to advertise their products, and is very persuasive. With this research, we are able to understand the strategies used by the sellers and advertisers in promoting their products. Then, the result from the research will be useful information to educate and inform consumers of the tactics used and how to avoid falling prey to falsely advertised products. It is important that consumers know thoroughly about the products to avoid any dangerous side effects,” said Mohd Yusof.